Everybody knows that young people lack the basic skills needed in the workplace. It’s not just a problem with skills. They have bad attitudes too. These reports appear every few months, gleefully covered by the newspapers and providing soundbites for grandstanding MPs. It’s no wonder, then that youth unemployment is so high. Surely, no employer in their right mind would want to recruit such people. I have long been sceptical about all this, though, because I first heard it when I was one of the people being complained about. Employers have been banging on about the poor skills and bad attitudes of young people since the 1980s, at least. Yesterday’s report from the UK Commission for Education and Skills (UKCES) provides some useful background to the debate. 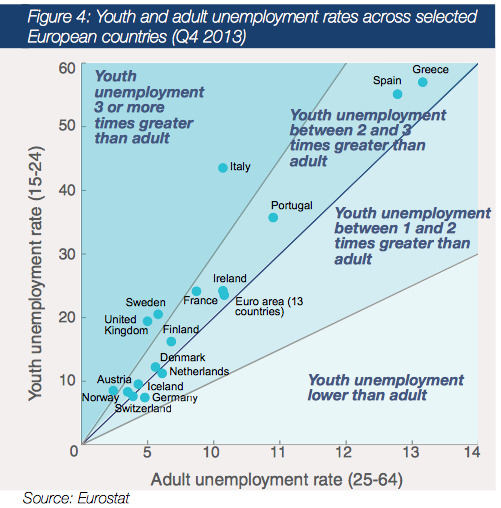 It found that, while the UK’s unemployment rate is below average when compared with other EU countries, relative to our adult unemployment rate, it is high. ← Pick your window Iain … you’re leaving!